Commoditized. No organization wants that word applied to its goods or services. Merely mentioning commoditization sends shivers down the spines of executives and entrepreneurs alike. Differentiation disappears, margins fall through the floor, and customers buy solely on the basis of price. Consider, however, a true commodity: the coffee bean. Companies that harvest coffee or trade it on the futures market receive (at the time of this writing) a little more than 75 cents per pound, which translates into 1 or 2 cents a cup. When a manufacture roasts, grinds, packages, and sells those beans in a grocery store, turning them into a good, the price to a consumer jumps to between 5 and 25 cents a cup (depending on brand and package size). Brew the ground beans in a run-of-the-mill diner, quick-serve restaurant, and that coffee-making service now sells for 50 cents to a $1.50 per cup. But wait: serve that same coffee in a cafe such as Starbucks – where the ordering, creation, and consumption of the cup embody a heightened ambience or sense of theatre – and consumers gladly pay $2 to $5 a cup. Businesses that ascend to this fourth level of value establish a distinctive experience that envelops the purchase of coffee, increasing its value by two orders of magnitude over the original commodity. The preceding paragraphs come from The Experience Economy, Updated Edition, written by Joseph Pine and James Gilmore in 2011. The book (an excellent one, by the way) establishes the concept of the experience, and why it is so important to organizations of all types today – ChurchWorld included. After reading the first release of The Experience Economy in 2002, I became fascinated at the lesson of the coffee bean and how it could be applied to ChurchWorld. In particular, how Starbucks was creating an experience. At Starbucks, an ordinary commodity – coffee – is transformed into an EXTRAORDINARY experience. ChurchWorld can learn a lesson or two – or three or four – from Starbucks. You can turn an ordinary process – welcoming Guests – into an Extraordinary Experience. Today is the fourth session of Summer Term II of the 2013 GsD program with Applied Guestology 201, a review of some of the leading organizations who deliver exemplary Guest Experiences with application to ChurchWorld. To learn more about the secrets to EXTRAORDINARY customer experiences at Starbucks, I began investigating Starbucks (now that’s research I have really gotten into!) to see what ChurchWorld leaders can learn. My quest for learning the Guest Services secrets of Starbucks began with a hot White Chocolate Mocha on a cold January day several years ago. I settled into a comfortable seat, observing the friendly, welcoming interactions between the baristas behind the counter and their customers as they walked in. I didn’t know I was in for Guest Experience 101. The single episode that sticks in my mind to this day was the following: While I was observing the barista’s interactions with customers, a young mother and her 3 year-old daughter walked into the store. As they were walking in the door, the barista came out from behind the counter, said hello to the mom, then knelt down in front of the daughter, calling her by name and engaging in a conversation for several minutes – all while other customers continued to come into the store. The store was well-staffed, so no one was held up by the barista’s actions. A seemingly small gesture? Maybe so, but it spoke volumes to me. Later I asked the barista what prompted her actions. She replied, “It’s in the basic training all partners take when they start working at Starbucks. 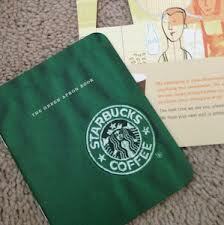 It’s called the ‘Starbucks Experience,’ and it’s all in this.” With that, she handed me The Green Apron Book. Containing no less than the core philosophies and values of Starbucks, the Green Apron book is a small package with a large impact. Its simple but powerful structure contains guiding principles of the environments Starbucks baristas hope to create and legendary service they strive to provide. But it’s really leadership at its best: simple instruction provided in an appealing way, with a spirit that encourages baristas to make each Starbucks Experience uniquely their own. View the store from a customer’s perspective. How does it look and feel? Along with the core purpose, values, and mission statement, the book provides partners with concrete ideas on how to personalize relationships with customers by giving to, connecting with, and elevating customer interactions. Creating the experience that keeps people coming back relies on the magical combination of three things: our products, our places, and our people. They come for coffee, stay for the inviting warmth, and return for the very human connection. Now go ahead, welcome your next new regular! Don’t you wish you could say the same things about your Guest Experience process? I was hooked! 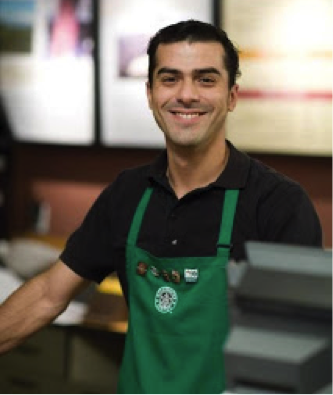 From that day on, I have been in and out of dozens of Starbucks all across the country, I have read all the books about Starbucks, I have talked with many baristas, and I even have the basic training materials used by Starbucks for new team members. Starbucks gets it when it comes to Guest Experiences – why shouldn’t the Church? You don’t need to copy the Green Apron Book for your Guest Experience team, but you do need to understand the principles behind it, develop concepts that will encourage your team to be fully engaged with the people they are welcoming to your campus, and apply them to your context. How are you serving the guests at your church? For all the promise of digital media to bring people together, I still believe that the most sincere, lasting powers of human connection come from looking directly into someone else’s eyes, with no screen in between. Love it or hate it (and it seems there’s not much middle ground) Starbucks began a revolution of “the third place,” creating an experience (with a price to match!) that consumers flocked to in droves. Even over the past few years with rising prices, store closings, and increased competition, Starbucks has some great lessons on Guest Experience that the church can learn. Central to the experience at Starbucks is the barista, the smiling face that greets you when you come into the store and takes your order. I frequent Starbucks across the country (it’s a favorite meeting place for church leaders), and I am amazed at the knowledge, uniformity of service, and general attitude displayed by the baristas. Starbucks understands the importance of the front-line interaction its baristas have with their customers. They realize that customers can go almost anywhere to get a cup of coffee, but the experience that Starbucks delivers is not commonplace. As a matter of fact, Starbucks will even cut into its efficiency (and the risks that entails) to make sure the experience being delivered is extraordinary. My quick answer: always default to people. In the equation Creating Experiences = Product + Process + Place + People, the most important part, the starting place, the foundation which all is built on – it’s people. Starbucks may have a good product lineup; it may have its service processes down to a science, and it may offer the most comfortable, friendly place to hang out alone or with friends. But neither product nor process nor place have any traction without the people greeting you with a smile, asking what you would like (maybe suggesting something new), and then servicing you with speed, excellence, and always a smile. You have to have a great team in place first before you can begin to deliver excellent experiences. The same is true in ChurchWorld: the experiences that you are attempting to create, the places and spaces in which they are housed – both literally and figuratively – are important. But you don’t get anywhere without the people. When an organization helps its team members bring pride, excellence, and playfulness to every aspect of their task, those team members literally have the chance to change the lives of those around them. People want to be a part of something bigger than themselves. They want to be a part of something that touches their hearts. Everything matters – but everyone matters more. Guestology – the art and science of knowing and understanding your guests – is a term originated by Bruce Laval of the Walt Disney Company. The use of GsD is a tongue-in-cheek acknowledgment that organizations that really want to understand and deliver a WOW Guest Experience need to study the best practices and principles in use today, and then adapt them to the context of their own environment. This entry was posted in Guest Experience and tagged Applied Guestology 201, Church Guest Experience, GsD Summer 2013, Guest Experience, Howard Schultz, Onward, Pour Your Heart Into It, Starbucks, The Starbucks Experience. Bookmark the permalink.